In 1961 British architect Cedric Price (1934-2003) conceived the project Fun Palace, a radical vision for an urban cultural centre. Although unrealised, the project has since become legendary, providing inspiration for numerous buildings such as the Centre Pompidou in Paris. Working with theatre director Joan Littlewood, Price proposed a programmatic fusion of traditional cultural institutions such as the theatre, museum or university within a single, temporary mega structure. The architecture of this gigantic laboratory was not conceived as a finished object but rather as a constantly changing structure that, like a theatre stage, would adapt itself to diverse and unforeseeable uses. The concept of the Fun Palace provides the starting point for a debate and brainstorming about medium and long term visions for the Palast der Republik, the former East German cultural centre and seat of parliament, and its surroundings in the centre of Berlin. Whilst the intention is to broaden the horizon of the debate about the programmatic and spatial qualities of a contemporary Fun Palace vision beyond the national and European context, it is the intention of the workshops to develop focused models and strategies for the Berlin site which will help to reinvigorate current and future debate. Fun Palace Berlin 200X offers a unique opportunity to reflect upon the temporary activities in the Palast der Republik and to debate the future of the site together with international experts from the fields of architecture, theatre, art, humanities and politics. 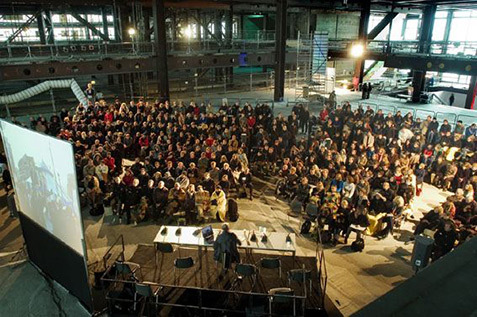 Public lectures, debates and talks as well as performances, installations and exhibition from the Price Archive provide a momentary escape from the prospect of the Palast’s imminent demolition and official plans to develop the site as a banal, privatised business complex, clad in the reconstructed facade of the long gone Prussian castle. The discussion will seek to address the following questions: What are the programmatic, organisational and spatial characteristics of an urban cultural centre in the 21st Century? Which new typologies of cultural institutions are presently being developed in contemporary China, Japan, Africa or Eastern Europe? Can disused buildings, such as the Palast der Republik, offer new opportunites for open cultural experimentation in an era of tight public budgets? What are possible futures for the site? Fun Palace Berlin 200X is a laboratory, stage and creative retreat – and an invitation to share one of Cedric Price’s favourite delights – the delight in the unknown.